Anamaya resort is an exotic place that is perched on the edge of a cliff overlooking breathtaking ocean views. It is surrounded by verdant rainforests just yards away from thundering waterfalls gracing shimmering pools of clear, cool water. Anamaya means “good health” in Sanskrit and this is embodied in the organic gourmet cuisine offered, the 200 hours of yoga teacher training, yoga classes and retreats and a variety of other activities that focus on harmony of mind, body and spirit. There are several Yoga Alliance teacher certification classes that usually run for four (4) weeks taught by some of the best yoga teachers in the world. 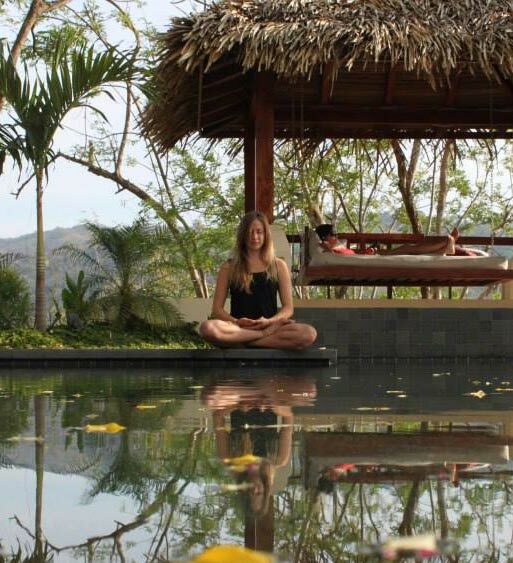 Embodying the words breathtaking, stunning and spectacular, Costa Rica Yoga Spa is nestled along the refreshing, untouched waters of the Costa Rican Gold coast in Guanacaste. 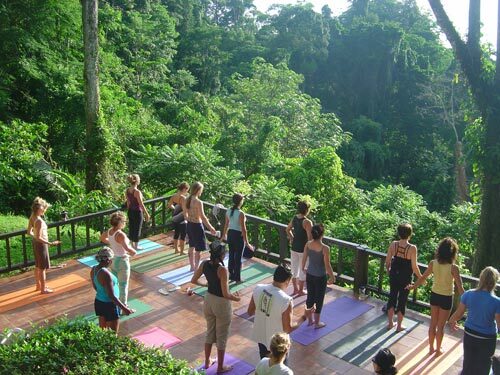 An easy distance from both the Rio Montaña and the Rio Nosara, this spa is the perfect setting to embark on yoga teacher training certification which is taught by their world class instructors. This is a lovely combination of study and enjoyment which comes alive in the surroundings and the luxurious accommodations provided. In addition to the yoga classes, surfing is also taught at this retreat so that it meets the needs of all its guests. Danyasa is an eco- retreat center, located just at the base of rain-forested mountains where the Baru River meets the sea. This center offers dance class, yoga retreats, yoga teacher training, meditation session, Kirtan, and music oriented retreats. For enjoying an expressive healing arts, healing bodywork and adventure tour Danyasa is an heavenly place. Danyasa offers multi-day packages designed to maximize the guest’s enjoyment and all the packages are affordable. While staying at Danyasa the guest will meet Sofiah Thom, co-founder of Danyasa, who will guide in the teacher training session and under the guidance of Sofia the practitioner can discover Inner and inter connection of mind, body and spirit. Marianne Wells Yoga School is a Yoga Alliance Registered School offering one of the most comprehensive yoga teacher training certification programs anywhere in the world today within Goddess Gardens. This school offers a variety of traditional yoga styles from which students can learn, internalize and synthesize their own teaching styles. The course offered seeks also to address certain perceived gaps in the other teacher training curricula. The teacher, Marianne, is determined to ensure that students leave as more confident and capable instructors and more deeply devoted practitioners of the craft of yoga. The methods used and taught here are also safe and effective. Directed by Mariela Cruz, the first American to receive the honor of being authorized to teach Ashtanga Yoga, Namaste Yoga Studio offers a 200 hours, a 300 hours and an apprenticeship program to its students. 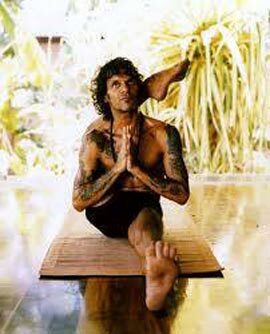 Ashtanga highlights the basic principles of philosophical foundation, breathing, bandhas and drishti in its practices. 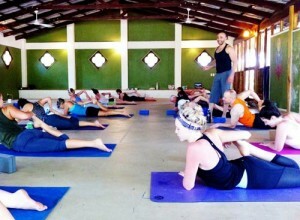 Classes are presented in Spanish and are recognized by the Yoga Alliance. The 300 hour program is only eligible to those who have already successfully completed the 200 hour program and includes workshops, classes on philosophy and practice of yoga, an apprenticeship with a mentor and teaching practice and specialization of expertise. Found in the tropical rainforest jungles of Guanacaste, Costa Rica, lies the unique, boutique Yoga Teacher Training facility of Nosarananda. Hosting no more than ten (10) students at any given time, Nosarananda prides itself on producing a curriculum that is in depth and personal. Incorporating local excursions, gourmet organic cuisine, yoga therapy and massage, detoxification retreats and teacher certification, the atmosphere here is guaranteed to meet the five levels of healing. Nosarananda focuses on hatha yoga teacher training (healing of the five bodies), restorative yoga teacher training (rest of the muscles and mind) and zen zwing yoga teacher training (experiential exploration). Nosara stands in a class of its own, having established an international reputation for being one of the best yoga training centers in the world. Located on the Pacific coast of Costa Rica, Nosara has been founded and directed by Amba and Brahmanand who have worked tirelessly to ensure that well deserved reputation of the Institution. Here awaits a rejuvenating and transforming experience for all who pass through these doors. They offer 200 hours of Interdisciplinary Yoga Teacher Training, several 100 hours of a variety of aspects of Teacher Training as well as 500 to 1000 hours of Professional Teacher certification. 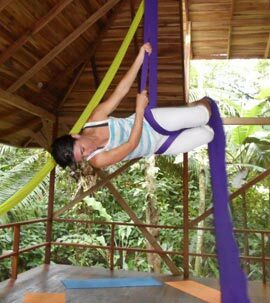 Pavones Yoga Center is located about 320 kilometers from San Jose along the Southern Pacific coast of Costa Rica. Here they thrive amid spectacular ocean views in the middle of the jungle. With the provision of luxurious accommodations, visitors and students can relax while learning to find health and well being from within. At Pavones everyone is afforded the opportunity to join any of several types of yoga classes: the Mixed Level Vinyasa Yoga, Yoga Tranquilo, Yoga Fusion, Candlelight Yoga, Surfer’s Therapeutic Yoga, Yoga En Español and Open Studio. They also offer five types of Professional Yoga Teacher Training Sessions taught by experienced instructors. Peace retreat, yoga studio is open to both locals and visitors. Surrounded by the jungle which is invited in a protective way by its screened walls, this is the place to experience healing retreats, workshops, yoga classes, teacher training sessions and ayurveda in the most real way. Another asset for Peace Retreat is its proximity to the quaint town of Liberia with its exciting restaurants and pristine beaches. The accommodations also help to provide an aura of natural harmony which also enhances the atmosphere of tranquility. There are three different Teacher Training Certification programs: inspirational yoga, body and breath yoga and prenatal/conscious birthing yoga training. Standing guard over Lake Arenal in Costa Rica stands the Rancho Margot. This is a business set up on eco-tourism and the tenets of family. Although it is a remote area, it is estimated to attract up to 10000 visitors annually. They offer 200 hours of yoga teacher training at the Center for Natural Living Yoga Teacher Training. The course is divided into two modules which must both be completed within a year in order to be certified by the Yoga Alliance. The complete course of two modules takes a total of one month. The curriculum focuses on techniques and methodology, anatomy and philosophy. Having being in business for 17 years since 1997, Samasti has improved and evolved to reflect the heart and soul of yoga principles. Built in the middle of the Biological Reserve and only 6 easy miles outside the Cahuita National Park, the Caribbean lodge Hotel embodies the concept of eco-tourism and self sufficiency. The accommodations here are first class while providing a natural atmosphere. There are several packages offered to visitors that are designed to meet their specific needs. The Hari Om Yoga School of Italy here also offers 200 hours of Yoga Alliance Certification Yoga Teacher Training once or twice a year. The theme under which the instructors at Goddess Gardens work is “Comprehensive, Inspirational and Personalized Yoga.” They offer 200 hours worth of yoga instruction per class. It is located in Cahuita in Limon Province which is on the Caribbean coast of Costa Rica. 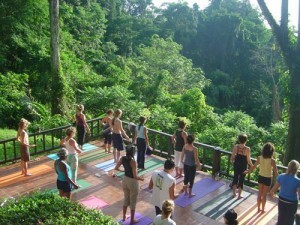 The Spiritual Retreat Center is encamped around by the jungle rain forest with a view that spans to almost 360 degrees. There are a number of retreat packages that are offered here that is sure to fit any taste. Students of yoga are also afforded choices in the length of study, the preferred instructor and the style of yoga. Along with all of these programs is the best group of instructors, facilitators and hosts to make the experience holistic, peaceful and comprehensive. 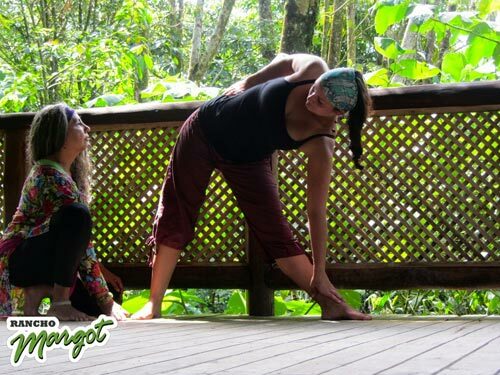 Located in San Pedro in San Jose, Costa Rica is the Yoga School and Thai Massage center called Yoga Mandir which means “Temple of Yoga.” A holistic experience is offered to both clients and student. There is offered yoga classes for clients of every age and all levels as well as for pregnant women and for others who are experiencing transitional life changes. There is also yoga teacher training certification programs spanning 300 and 400 hours respectively which are certified by the Yoga Alliance. Finally, there is also offered training of up to 130 hours in Thai massaging techniques up to level four (4).